I never thought I’d go shopping in Malaysia. It’s always Singapore and Bangkok that I associate with shopping, never Kuala Lumpur. I have other trips in the works, so shopping isn’t really something that I should be doing. But I’m weak, so I succumbed to the call of several material items. Well, chocolates and tea. I was the only one in our group who walked away empty handed from our shopping stop at Sungei Wang last Sunday. Of course, Monday changed everything. Jonker Walk in Malacca is just plain evil. Not only is it overly crowded with daytrippers, there are plenty of stalls selling all kinds of knick knacks and food that are calling out for you to buy them. Wotta haul! Is that a Liverpool cellphone charm I see? It all started with that impromptu stop at Beryl’s Chocolate Wonderland. Two bags of chocolate, followed by a pack of Aik Cheong coffee from their store in Malacca. In Malacca, I also picked up a magnet, a couple of Pullip-sized dessert tray and three cute cat keychain and charms. From Malacca, Ferdz and I dropped by Kinokuniya at the Suria KLCC, where I promptly picked up Volumes 1 to 4 of Your & My Secret (Boku to Kanojo no) by Morinaga Ai. Genting wasn’t just a place for fun and games. There are plenty of shops for some (or a lot) of retail therapy. Diadora was on sale, so I picked up a couple of shirts for my dad. At Cameron Highlands, I went crazy buying tea, which is the region’s specialty. I bought strawberry tea from the market, as well as some dried bittergourd (yes, ampalaya). Our last stop for this trip was the BOH Tea Plantation. I went even crazier buying different kinds of tea at their shop. So, I did not find Pullip nor even Blythe stuff in KL, but it still pwned me. And I’m still thinking of buying even more chocolates tomorrow. Hi Nina. Nice to hear about your shopping experience in Malaysia. I’m Malaysian residing in Kuala Lumpur. The Sungei Wang and Suria KLCC are among the popular shopping places in Kuala Lumpur. I also like to go to Kinokuniya at Suria KLCC. 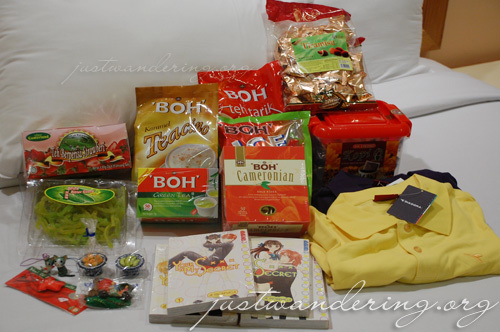 From the photo above, I can see the “Teh Boh” which probably the most popular tea brand in Malaysia. The tea leaves for this brand are planted in Cameron Highlands. Thank you Nina for this post and hope to hear another stories from you soon. I know that irresistible feeling of buying something while traveling! We do want something to remind us of a trip. But are you squeezing them all in a backpack or you’re traveling with a suitcase this time? BTW, I’ll be in Manila this Sunday and thanks to your old post that I happen to read, I’m going to drop by the Travel Mart at SM. Hope you’re back safely in Manila then! just stumbled upon your blog. will be flying back home from Jo’burg to Manila via KL, and was wandering if it’s advisable to go out of KLIA while waiting for our connecting flight to Manila? Will spend around six hours before the connecting flight and would not know or have any idea on what to make out of that six hours. had used HKIA before, and that was another story. Hope to hear from you. LIVERPOOL LIVERPOOL LIVERPOOL LIVERPOOL OMG ILU!! !